This is Biochemistry Practical section category. 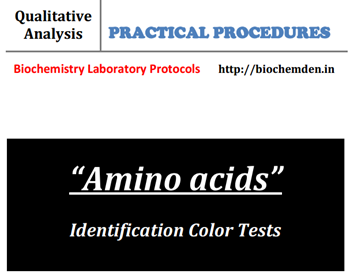 In this category, Carbohydrates, Amino acids, Lipids and Proteins color reactions topics included. We are providing the laboratory protocols in ebook format (PDF). Just download and make a copy along with Practical Observation sheet. Lipids are one of the major constituents of foods, and are important in our diet. Biology lab protocols presents the student with selected chemical reactions of the Proteins and some of the amino. Several qualitative tests have been devised to detect members of this biologically significant class of.